Wendy has no hesitation in saying that the highlight of her career so far is winning a gold medal at the Atlanta Olympic Games in 1996. There are, however, two tales within this amazing story. The first is the fairy tale of the young woman who rides her pony club horse at the Olympics and wins a gold medal. The second is the tale of Wendy breaking her leg nine weeks out from the Olympic Games. Thanks to grit, determination, and a metal plate and several screws keeping her leg together she still rode at the Olympic Games and won the gold medal. Put the two tales together and you have a story worthy of an Oscar. One thing that struck me after I came to Australia was how much pride the country takes in its deserving athletes. Partly this made an impression on me, because growing up I was not aware of much of a sports culture in my country. Yes everyone I knew was mad about soccer, but these were English clubs they were supporting. Also the money simply was not available for proper sporting facilities for hopeful Olympians. Saying that though, I did grow up in the same town as Michelle Smith, Rathcool. I even caught the same bus to school as equestrian Cian O’Connor. So often it appears as if the spectacle of sporting events, seemingly always occuring in some stadium in a foreign land, causes us to forget that these are ordinary people, from ordinary places, which was why I enjoyed the personal perspectives offered by An Eventful Life: Life Stories of Eventing Champions. In her opening foreward publisher Debbie Higgs asserts that [this] is not just a book for fans of equestrian sports – it is a book for anyone interested in how people with extraordinary talent and perseverance can become Olympic champions. This for me is the real heart of the book. Too often the careers of sportsmen are forced into a global historical narrative. This book instead concentrates on the personal. Alison Duthie presents a series of journalistic profiles of several Australian Olympians. A welcome addition to the selection of sportspeople is young up-and-comer Emma Scott. The book’s appendix lists an impressive selection of appearances by Scott on the equestrian circuit since 2007. The other professional horse-riders who partake of eventing have already experienced a whole series of highs and lows across the world. Emma Scott’s story has not yet truly begun. The book’s subjects are Megan Jones, Sonja Johnson, Shane Rose, Wendy Schaeffer and Stuart Tinney. Collectively they can hold claim to an incredible assortment of medals and prizes. We learn how each of them first came to the sport, often with the generous help of family members and friends, as well as the experiences they shared with the horses that carried them to victory. One of the book’s strengths is that the relationship between horse and rider is emphasised through the testimonies of these athletes. They speak of them as animal friends, or even colleagues of a kind, but never dismissively as ‘beasts’. The level of dedication and determination required by the sport can also bring a dangerous cost with it. The quote I chose to open this piece gives an example of the extraordinary lengths Wendy Schaeffer was willing to go to in order to attend the Olympics despite serious injury. Shane Rose had to undergo major reconstructive surgery after he was struck in the face by a horse. While escaping injury himself, Stuart Tinney’s horse Jeepster leaped into the crowd of onlookers at Badminton in 1999. That all of these athletes would continue on despite the harships and occasional mishaps of a life in professional sports shows just how dedicated they are to equestrianism. Many have even become trainers of the next generation themselves. Writer Alison Duthie herself trained in the sport and her familiarity helps convey the personal stories told here with an added degree of insight. There is even a wonderful collection of photographs included at the end of each chapter, illustrating the careers of these men and women. The tone of the book is both warm and enthusiastic, enough to encourage the interest of anyone, regardless of their interest in the field. Well told, insightful and fascinating. A genuine treat. With thanks to Palmer Higgs Publishing. Oh dear. It appears that I have aged overnight. Yes, my thirty-second year on this blue ball has begun. Already I can feel my body becoming more decrepid, the toll of old age setting in, my memory growing foggy. Actually, scratch all that. I feel fine! What’s more I woke up this morning to some lovely bookish birthday presents from Stephanie, which I am sure I will be reviewing on here shortly. In an unusual manner, today’s book echoes my oscillating mood this morning. 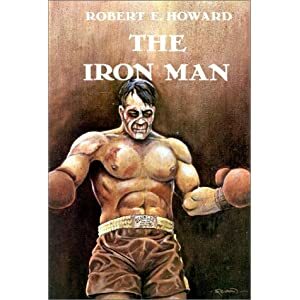 Robert E. Howard evidenced a fascination with physical prowess in his Conan novels, among others, but in The Iron Man he focuses on the damage that can be done to a body. Ultimately, however, the book’s theme is a far more daunting contest between the limits of human endurance and the salvation offered by true love. Howard’s narrator first witnesses Mike Brennon fighting against a carnival act in Nevada. The young man shows a great capacity for taking pain and throwing wide, powerful blows, but no real technical aptitude for boxing. As it turns out, Howard’s first person narrator is Steve Amber, a fight manager, who is at first rebuffed by Brennon. Then the intense boxer seeks him out months later with a renewed passion for professional contests. Never one to pass up a good opportunity, Amber puts him into training. He is dismayed to note that Brennon seems incapable of developing any real pugilist skills. His stamina and natural strength are his only real advantages, certainly not enough to justify sending him into a bout against a first-rate fighter. Nevertheless Brennon insists. His desire to win real prize money concerns Amber, as his rookie contender seems willing to put himself through any amount of punishment in order to make some cash. When Brennon gets into the ring with Monk Barota though, Amber and his partner Ganlon realize that they have no ordinary fighter, but a real Iron Man. He cannot even feel his opponents punches, his body numb to the pain that Barota is undoubtedly causing. From absolute no-hoper Brennon is catapulted onto the national boxing scene as a star, a modern day Iron Man, capable of outlasting any opponent. True he does lose some fights on points, but he is seemingly incapable of being knocked out. Amber grows increasingly concerned though, as to why his fighter’s seeming greed for money never abates. His behaviour seems miserly and obsessive, a dangerous combination as over three years Brennon begins to slow down even more. He is compelled to continue fighting, despite Amber’s warnings that he risks not only serious injury, but a complete mental breakdown. Howard captures the desperation and excitement of the early twentieth century boxing scene, but also the gradual fade from showmanship into sadistic bouts of bloodletting. Brennon rarely emerges from a fight not looking like tenderized raw meat. His obsession with fighting risks his health and all in the name of attracting bigger crowds, bigger pay cheques. Howard appears to be describing the actions of a near-mindless masochist – until that is, the story’s twist is revealed. The writing itself seems anachronistic, but then The Iron Man makes no pretense at realism. This is the kind of story where a character in a moment of passion will exclaim ‘Applesauce!’, as opposed to a more vulgar expression. It also has a welcome beating heart full of sentimentality hidden beneath the bruised and torn flesh of the fighters. I was pleasantly surprised by this book. It captures the thrill of boxing, but not without a critical aside on the physical toll levied by the sport. A very enjoyable yarn.